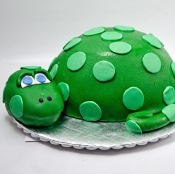 Dinosaur Birthday Party Ideas for kids. This is a favorite for boys and girls alike. This is such a fun theme with so many cute possiblities! Be sure to have a few disposable cameras on hand so guests can help take photos. Celebrate Express has some cute party decorations such as this set of party items. Don't forget to check out the Dollar Tree, WalMart, Target and craft stores for inexpensive decorations. Here is an option for a personalized party invitation or you can make your own. Make big foot print flip flops. There are many cute dinosaur costumes you can find or have these masks for each child to wear. White tablecloth. Use butcher paper and print footprints or use sponges shown below. Smooth pebbles used for crafts to arrange on table. Cut out big construction paper dinosaur footprints and tape it from the front door to the party area. Red Punch (Hot Lava Punch)Add some sprite or 7up for some fizz. Here is the dinosaur dirt cake with dinosaur gummies that we had while at T-Rex at Disney World. We have a recipe to make our version. Click on the picture to see it. Click on the pictures to see the other cakes. Plaster of Paris, dinosaur figures, plastic trees, sand, paint and sand and you can make this kids party craft to match your theme. See HERE for complete details and how to. Fill a sand table with clean dry sand. Bury plastic dinosaurs you can get at crafts stores, dollar stores or any store with a toy section. Use a sand shovel or a sand sifter and let each child find a few dinosaurs to take home as party favors. 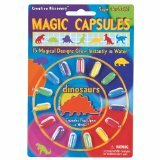 Or fill sand buckets with sand and bury these dinosaur caplets below and let each child "excavate" a couple. Create a picture using these fun shaped sponges or print these on white butcher table for a colorful tablecover. Easy painting craft makes this a fun make and take. Click on the picture for more details. Pin the tail on the dino...or pin the missing plate on the Stegasaurus, etc. Play charades and each team has a dinosaur to "act" out for the others to guess which dinosaur it is. Give some props to give the hints like plastic kids food meat or veggies. Blue and brown construction paper representing water or land. If you enjoy paper mache, you could make spikes, plates, horms too.